Last week, The CW held its highly anticipated four-show “Invasion!” crossover event, with the characters from Supergirl, The Flash, Arrow, and Legends Of Tomorrow all joining forces across three nights (because one of them didn’t count) to defeat an intergalactic threat. 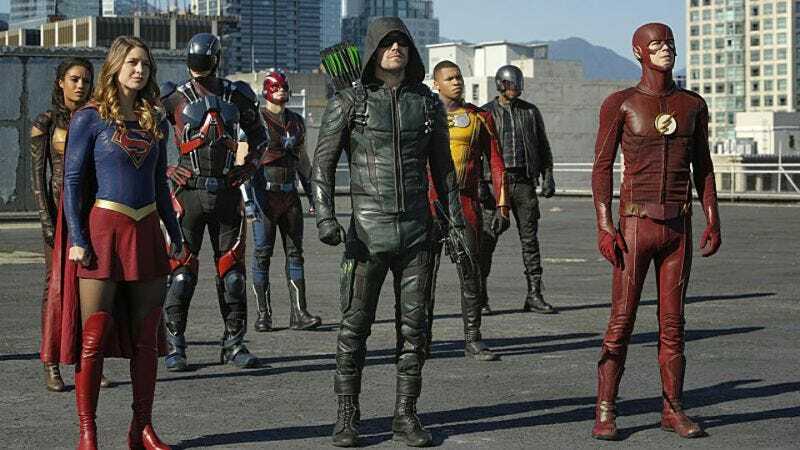 In addition to being an overall thrilling superhero adventure, the crossover gave the shows some of their best episodes in a long time—especially Arrow, which had the benefit of its 100th episode conveniently lining up with the event. It’s not just the comic book fans who enjoyed the crossover week, though, as it also gave The CW its most-watched week in six years (as in, before Arrow kicked off the network’s superhero renaissance). This comes from Deadline, which breaks some of the more specific numbers down, but the highlights are that Monday’s Supergirl episode got the show’s highest ratings of the season and The CW’s highest Monday ratings in general since 2008, The Flash got its highest ratings 2014, Arrow got its highest ratings since last year’s crossover episode and more than doubled the ratings from its last non-crossover episode (in the 18-34 demographic), and Legends Of Tomorrow got its most-watched episode ever. Essentially, the whole four-show mash-up experiment was wildly successful, and The CW is probably going to keep doing this superhero thing for as long as it possibly can. Also, let’s not forget that The Flash and Supergirl are going to do a musical crossover later this season, so there’s more team-up fun and ridiculously good ratings to look forward to for both superhero fans and CW executives.